Our Emergency Pet Key Ring Tag & Wallet Card set is a must have for every pet owner. If you ever find yourself in an emergency situation and unable to immediately return home to care for your pets, our best selling pet safety items will help emergency personnel alert your emergency contact to care for your pets while you are unable to do so. Each set includes one (1) Emergency Pet Key Ring Tag and one (1) Emergency Contact Wallet Card. Every set sold provides 5 meals for animals living in shelters! Please consider ordering these safety items for your friends and family who have pets in their home! 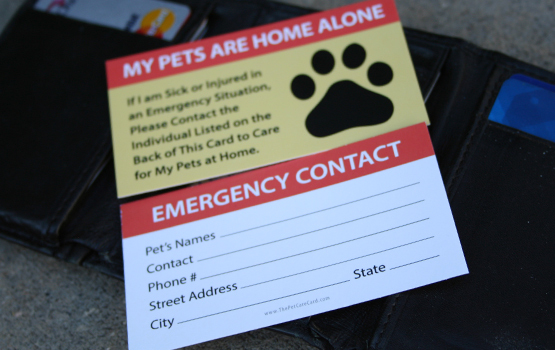 If you are ever in an accident, sick or injured and unable to immediately return home to care for your pets, our Emergency Contact Wallet Card can easily be found in your purse or wallet alerting those around you that your pets need care. The back of the card has spaces for you to note the name, phone number and address of your emergency contact to help emergency personnel easily alert your contact person. These cards are roughly the size of a standard credit card and fit neatly into your purse or wallet. 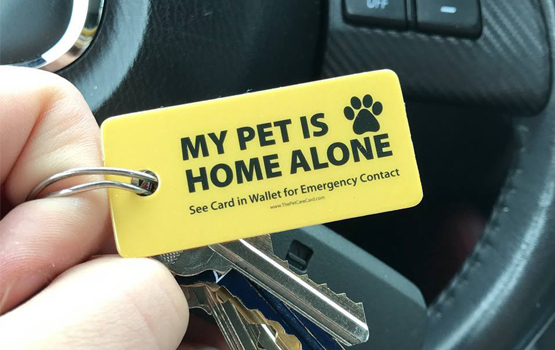 The perfect addition to our Wallet Cards, our Emergency Key Ring Tag is another way to make sure your pets will always be taken care of. These bright yellow tags help direct emergency personnel to the Emergency Contact Card in your purse or wallet. We've designed these tags to be easily seen and are more durable than a standard key ring tag you would get from a gym or grocery store.